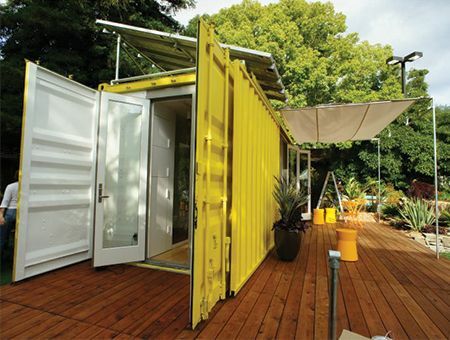 Joel Egan is the vision behind Cargotecture, a Seattle-based development firm specializing in recycled container homes. Egan has been in business since 2003, so it's no surprise his work caught the attention of Sunset Magazine long before others hopped on the bandwagon. 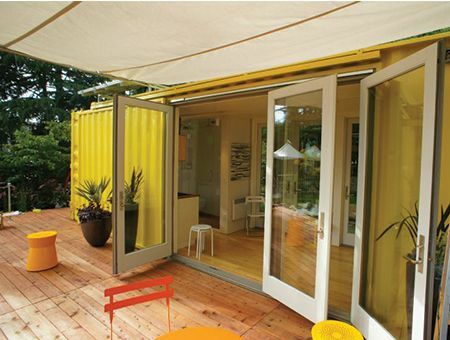 This c192 Nomad was adapted as the publication's idea house ‒ the only container home to earn that recognition. Of course, the home's bright yellow interior is right in step with the magazine's sunny West Coast outlook. 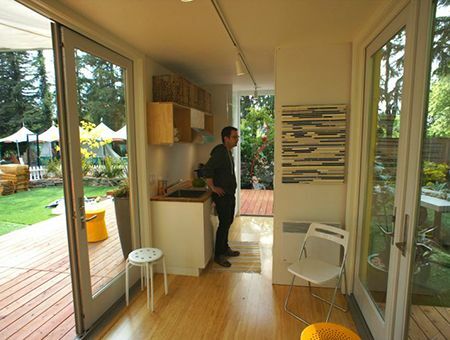 A roomy back porch leads to spacious interiors within, separated by large glass doors to let the light stream in. 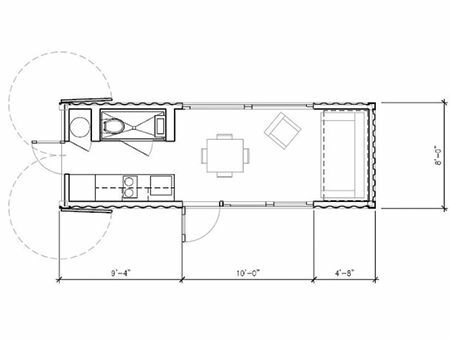 The interior floor plan shows a spacious living room, which can include a roomy sofa and eating space for four. A full bath is situated across from the kitchen. Overall, the home comfortably sleeps four. Inside, bamboo floors offer a chic yet sustainable footprint. Full-size windows on three sides create an incredibly light-filled space. 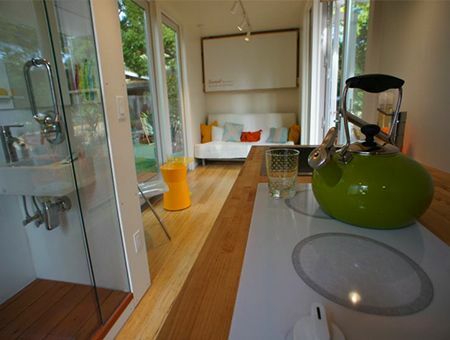 A fully functional kitchen is positioned off of the entry, complete with a large basin sink and cooktop. Overhead cabinets offer extra storage for dishes and accessories. In the kitchen and bathroom, sleek Duravit fixtures offer a touch of luxury. The kitchen is clad in butcher block countertops with a built-in cooktop. 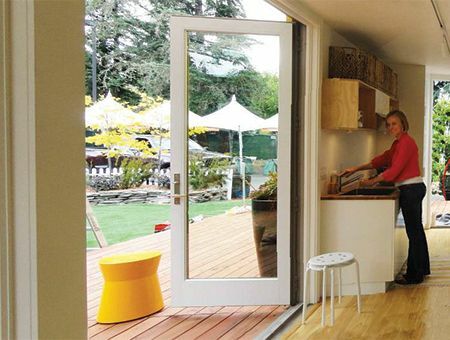 In temperate West Coast climates, the ability to open up the home is key. 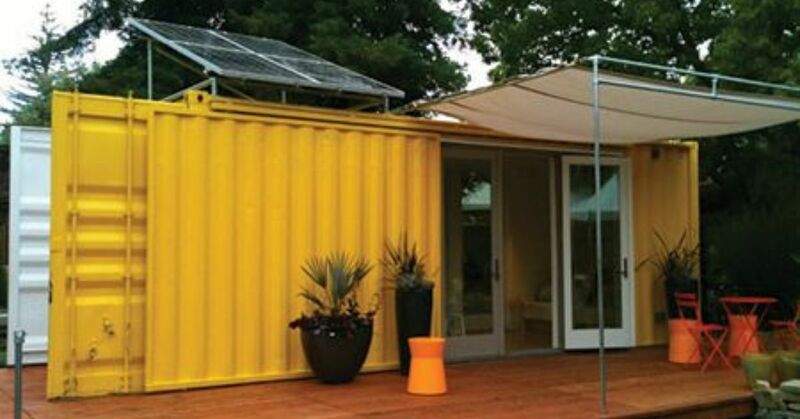 The container opens on two sides to let air and light flow through. 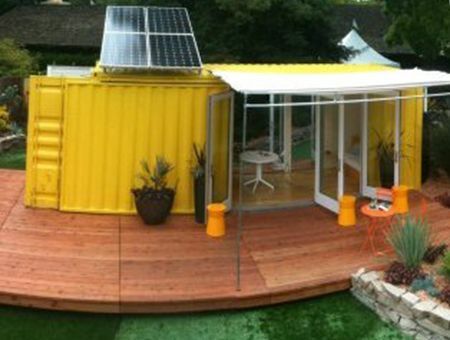 Rooftop solar power provides the home with all of its energy needs, making it truly sustainable and transportable ‒ the hallmark characteristics of a Cargotecture original.